What would you do with pickled cauliflower? What would you serve them with? Truthfully, these go with everything. They're a little bit spicy and they're tart and savory and crunchy. They'll wake up your taste buds before a meal, and they work well with fried food and tacos. I've been mowing through jars of these, with no stopping in sight. For this recipe, I used two different salts from our most recent sponsor, Chicken Salt: the Red Pepper Chicken Salt and the Turmeric Chicken Salt. Since this is so simple to make, I've been making small jars of it, to save storage space in the refrigerator. But you can double or triple or quadruple the recipe. These are quick pickles, so they stay nice and crisp. Since they're not preserved, you'll need to store them in the refrigerator. 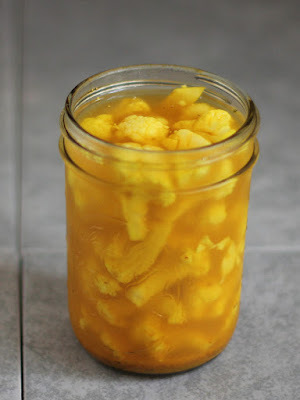 Cut the cauliflower into bite-size pieces and fit as many as possible into a pint jar. Add the Red Pepper and the Turmeric Chicken Salt. Put the vinegar and water into a microwave-safe container. I used a glass measuring cup, so just one container for measuring and heating. You could also heat this on the stove in a pan. Heat to boiling. Pour the hot water into the jar and screw the cover on firmly. Shake the jar to make sure the spices get nicely mixed in. Let the jar come to room temperature, then refrigerate until chilled. This is done as soon as it's chilled, but it continues absorbing flavors as it sits.